The School of Media and Performing Arts will host a performance symposium at the Hendon campus on Saturday 13 December. Leading dance artists and choreographers will be at Middlesex University on Saturday 13 December, to take part in Transmission – A Performance Symposium, hosted by the School of Media and Performing Arts. The symposium is the latest event to be organised by Middlesex Dance academics, and brings renowned practitioners together within a performance-focused context in order to present, argue for and celebrate the increasing number of approaches used when staging the work of others. 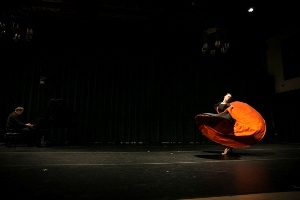 Many dance practitioners will be familiar with the 're-' proposition when it comes to re-staging, recreation, reconstruction or re-envisaging other artists' works, and the symposium has been curated to add more depth to this discussion. Solo, duet and quartet varinats of work by choreographers Martha Graham, Doris Humphrey, Anna Sokolow, Mark Franko and Robert Cohan will be performed or screened at the event, before their methods are debated and discussed. "We're delighted to be hosting the Transmission symposium at Middlesex," said Lesley Main, Head of Performing Arts at Middlesex and curator of the event. "The programme includes Robert Cohan's most recent work, 'Lingua Franca' and the first European performance of Martha Graham's solo, 'Imperial Gesture' by American dance artist, Kim Jones. Other choreographers and performers contributing to the symposium include Anne Donnelly, Yolande Yorke-Edgell, Lesley Main, Louise Kelsey, Mark Franko and Fabian Barba. Transmission – A Performance Symposium takes place on Saturday 13 December, from 10am to 4.30pm in the Grove Dance Theatre at the Hendon campus. For more information, visit the Transmission website. To book your place at the symposium visit: bit.ly/Transmission2014.